Barcelona star Lionel Messi has now moved 10 goals clear of rival Cristiano Ronaldo in the race for this year’s European Golden Shoe award. 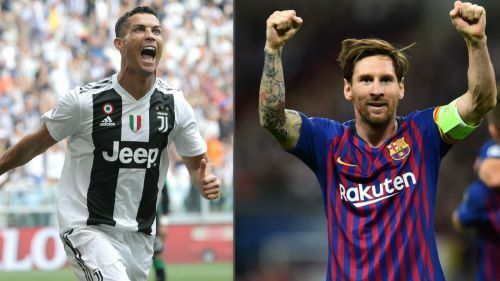 Messi and Ronaldo have won the European Golden Shoe more times than any other players – the Argentine has won it five times, while the Juventus star has won it four times. However, both players are once again in contention after yet again proving their potency in front of goal this season. Ronaldo’s move to the Serie A appears to have taken a bit of a sting off their rivalry, but on the European level, both players remain very competitive. Messi has won the last two European Golden Shoe awards and is currently aiming for a third straight triumph, although the Portuguese cannot be ruled out of the race either. Despite both players often top-scoring in Europe’s top five leagues, Paris Saint-Germain’s Kylian Mbappe is running them close, having also scored lots of goals in Ligue 1 this season. Messi continued his impressive scoring run over the weekend with a hat-trick against Real Betis in La Liga. That was the Argentine’s 51st career hat-trick and it took the Argentine to 29 league goals this season, putting him top of the European Golden Shoe race. Unsurprisingly, Ronaldo is 10 goals behind the Barcelona star, having netted 19 Serie A goals this season. In fact, the Portuguese has been overtaken by 36-year-old Fabio Quagliarella as top-scorer in the Italian top flight. It is, however, fair to note that Ronaldo has been rested in Juventus’ last two Serie A games. Meanwhile, Mbappe comes in second place in the European Golden Shoe race with 26 league goals, while Quagliarella follows suit with 21 goals. Ronaldo has now dropped to fourth on the list with 19 league goals, together with AC Milan striker Krzysztof Piatek. Both Ronaldo and Messi will not be in action over the next two weeks, as players from top European clubs will show up for their countries in the international break. European Golden Shoe: Where would Cristiano Ronaldo rank if penalties were not counted?